Instant Orchestra aims to take the pain out of creating orchestral parts — but can such an affordable library still produce the goods? 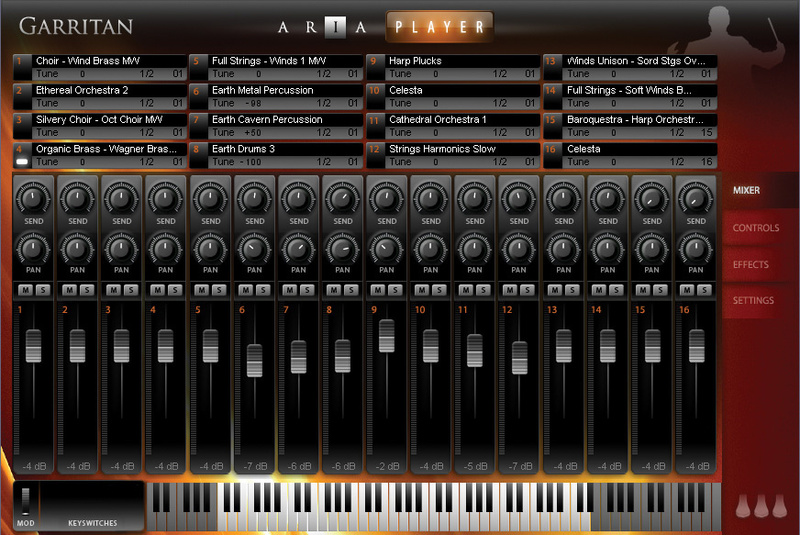 The ARIA player's main screen, showing a 16-way, fully multitimbral setup of instruments from Garritan Instant Orchestra. Because of the library's small RAM footprint, large setups like this will load in less than 10 seconds! Back in 2004, Garritan Personal Orchestra enabled impecunious musicians to engage in the noble art of orchestral writing without having to take out a second mortgage to buy the samples, or attain a master's degree in computer science to work out how to use them. Personal Orchestra's selling points were (and are) its low price, logical approach and thoroughly comprehensive instrumentation. 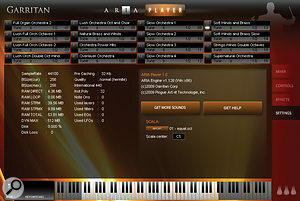 In 2009, a fourth revision, GPO4, made users' lives even easier by porting the formerly Kontakt-formatted samples over to the simple-to-use ARIA sound engine (designed by the French company Plogue). You can read the Sound On Sound review of GPO4/ARIA at /sos/jun10/articles/personalorchestra4.htm. Encouraged by the popularity of his eponymous creation, Gary Garritan decided to make a sequel. The samples for the new library were recorded over a long period in a variety of locations: in the Czech Republic with the Moravian Philharmonic Orchestra, and in New York and Seattle with US musicians. All in all, several orchestras and hundreds of players were involved. The resulting 1.87GB collection (which, like its predecessor, runs exclusively on the ARIA sound engine) is called Garritan Instant Orchestra, the title reflecting the short-attention-span, I-want-it-now world we live in. In the words of its creator, "Instant Orchestra is about producing orchestral music instantly and easily.” Can such a complex and demanding task really be so simple? Let's find out. Rather than using solo instruments for ensemble building, as in GPO, Garritan Instant Orchestra contains pre-packaged combinations of instruments. And though its patch menu lists familiar categories such as strings, brass, wind, choir, and so on (more of which later), what differentiates it from conventional libraries are patches that mix and blend instruments from different families. The most complex of them are found in the Blending Textures folder: these cleverly programmed confections contain multiple layers which can be crossfaded with the mod wheel or expression pedal, allowing you to switch or fade from one sound to another. The beauty of it is that, rather than you having to load a complicated setup to achieve this, all the action occurs within a single patch. A good example is 'Complete Orchestration': this starts off as a quiet, woodwind-dominated timbre and opens up into a big, heroic, Hollywood-esque strings-and-horns soundscape when you push up the mod wheel. A similarly dramatic transformation occurs in 'Delicate Orchestra — Ethereal', where a choir (singing the immortal lyric of 'ah') can be floated in over a blend of soft strings and woodwinds. Such versatile combinations can add colour and tonal movement to arrangements with very little effort on the part of the user. Since it's the first to appear in the alphabetical list, the 'Baroquestra — Harpestra' patch is likely to get a lot of use — which is no bad thing, as it's a very agreeable layering of harpsichord and strings which combines the two principal qualities all keyboardists seek: a strong attack and a satisfyingly rich sustain. When you push up the mod wheel, the harpsichord is replaced by a harp, a neat trick only slightly subverted by the harp being an octave higher than the strings (personally, I'd have preferred unison). There's no such criticism of 'Clarinets — Silvery Winds', in which an austere, vibrato-free clarinet patch can be subtly crossfaded with a luscious flute ensemble, a beautiful texture for accompanying a lead line. While these sounds effectively capture the mood of a real orchestra, you can also use them in a more abstract, synthesizer-like way: for example, flutes slowly mutating into oboes or muted sordino strings dissolving into a big, warm, enveloping cathedral choir may not be sonorities you'd experience in a Beethoven symphony, but they're certainly interesting and creative sound sources for contemporary arranging and sound design. GIO's 'Controls' page offers three-way parametric EQ, a stereo 'Stage' effect and MIDI-controlled settings for ADSR, filter settings, vibrato rate/amount, and so on. 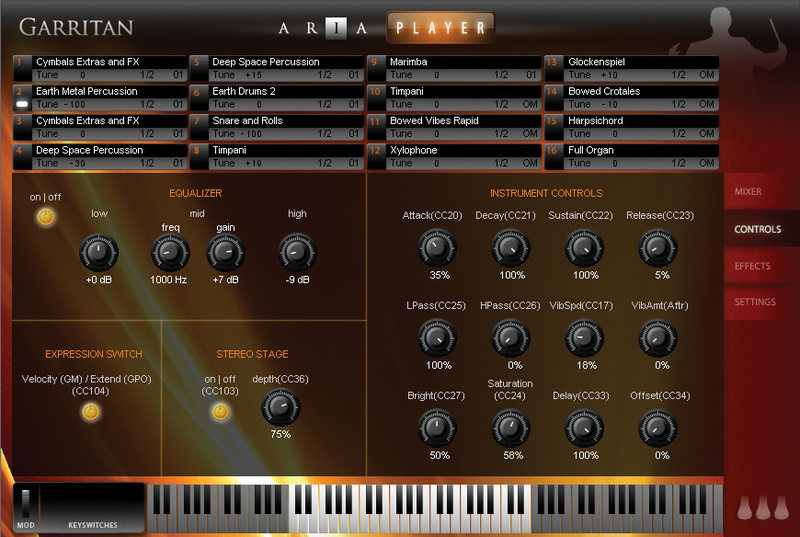 A convolution reverb effect with 10 user-configurable presets is also available on a separate page. GIO's 'Mixtures' folder contains the building blocks from which the above-mentioned Blended Textures patches are constructed. I enjoyed the delicate tonal shifts and subtle, built-in volume swell of Evolving Orchestra, and if I needed a big, symphonic pad I'd be happy to use the Full Orchestra patch, which skilfully blends trumpets and horns over a full string ensemble which happens to feature very nice high-end violins. In the same vein, 'Lush Full Orch Octaves' has real size and presence, while 'Full Organ Orchestra' evokes a sense of religious awe by layering a massive-sounding pipe organ and choir over strings and brass. If you don't have decent orchestra hits in your collection, GIO's abrasive tutti stabs will fill the gap. Defying convention, they're played in multi-octave unison rather than pre-voiced as chords, so you can play your own chords on them, to great effect. For the final gesture in your next orchestral masterpiece, I can recommend the patch called 'The Big Chord'. Its wide spread of octaves sounds great playing an apocalyptic final trump, although you should refrain from including too many notes, for fear of it sounding like an out-of-control theatre organ. For those whose fingers stubbornly refuse to form the requisite shapes, 'Easy' patches offer pre-programmed major, minor, diminished, augmented and sus4 chords in all 12 keys. These sound, to me, as though they were created by layering multiple pitches, rather than being played as chords by an ensemble in real time, so their effect is not terribly realistic, but at least all the notes are in tune! GIO's Settings page, showing details of the currently selected patch. GIO's instrument-family patches are the foundation of its more complex textures. I loved the dramatic marcato/staccato string section, which maintains a delightfully sharp, biting attack from top to bottom, and preferred the lyrical, comparatively dreamy and reflective delivery of 'Full Strings Sustain 2' to GPO4's string ensemble. The brass department houses big, regal sections of blended horns, trumpets and low brass, and impressively steady, tuneful, sustained notes played by a nice, bright-sounding trumpet duo. There are no separate straight-note horns patches, and though trombones can be heard in the brass ensembles, the only stand-alone bones patch is a staccato-attack delivery designed to be used as an overlay. For woodwinds, you can take your pick from a full blended ensemble of bassoons, clarinets, flutes, oboes and French horn, or more instrument-specific patches such as a clarinets group (featuring a nice low-register bass clarinet) and the double-reed family of oboes, English horn and bassoons. Honourable mention should also go to the library's heavenly, ecclesiastical mixed-voice choir, which I found an inspirational composing tool. The 'Super-Light' piano lives up to its name, not by automatically playing a Barry Manilow song when you load the patch, but by offering only one (loud) dynamic layer. While that sounds OK in an ensemble, the lack of soft, quiet samples greatly limits its musical versatility. There again, it's unrealistic to expect to find a deeply sampled grand piano recorded from five mic positions in a library of this size and price. GIO's harp sounds sweet and pleasantly lyrical: GigaStudio veterans may recognise some of its samples (which include an extensive menu of excellent glissandi) from Garritan's turn-of-the-century Giga Harp library. A decent selection of standard orchestral percussion (including timpani rolls and pitch-bend effects) and tuned percussion is supplemented by spooky 'Space Percussion' tones that evoke slow-building panic on board the spaceship Nostromo. Bowed vibes are also cunningly employed to create BBC Radiophonic-style sci-fi cluster-chord noises which would have sounded at home in an experimental 1950s radio broadcast. Rumbling, clanking and slithering 'Earth Cavern' cymbals and bass drums are also good sound-design fodder, and a set of large, reverberant, ethnic 'Earth Drums' tick the obligatory 'cinematic' box. Moving into the realm of the aleatoric, 'Horrid Choir' and 'Chaos' patches generate deliberately out-of-tune note combinations which are never the same twice, and so make an unpredictable, profoundly atonal racket when played chordally. Horrible, but in a good way... the madness intensifies with a collection of completely bonkers orchestral wild-card effects ranging from controlled chaos to just plain chaos, including tutti unisons which degenerate into random, atonal improvisation and some great rises from a discordant starting point up to a triumphant, unison high note — all great material for the intrepid arranger. GIO also has a selection of Ensemble presets located in 'Combos & FX' and 'Moods' folders. 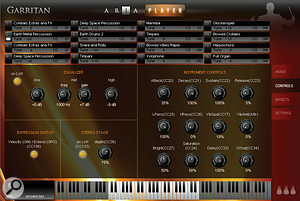 These multis provide a variety of imaginatively layered patches and effects, further expanding the already considerable range of musical textures. For a full list of the library's contents, download the manual at www.garritan.com/IO/Garritan_Instant_Orchestra_Manual.pdf. GIO doesn't use keyswitches, but offers so much mod-wheel control over timbre that you're unlikely to miss them. Although velocity is used as the default primary volume controller, the mod wheel, MIDI CC11 (expression) and CC02 (breath control) also control volume. This allows you to determine the initial volume response via strength of touch, then swell or fade sustained notes with the wheel, expression pedal or wind controller. Alternatively, velocity volume control can be de-activated (as in GPO): when you do that, velocity becomes an attack controller, enabling you to trigger fast note attacks with quick key presses. Working with GIO and Aria is very fast: patches load quickly, and even a full 16-patch ensemble can be ready to play in five to 10 seconds. Deleting patches is instant: you click on the patch name, select 'empty' (sensibly placed at the top of the menu) and it's gone. To undo any edits you've done on a patch, just hit 'reload' and the original will be restored. Although established film composers can still command a decent fee and employ real orchestras to perform their scores, background music for lower-profile media needs to be produced more quickly and cheaply than ever. TV composers are now paid less than they were 15 years ago, and producers want finished music delivered in double-quick time; in such a climate, it makes sense to work quickly and efficiently. Enter Garritan Instant Orchestra. For relatively little outlay, you can create a passable impression of a full orchestra, and spend more of your precious time composing rather than fiddling around with obscure articulations and huge MIDI templates. As with GPO, the sampling is less deep than high-end orchestral collections and the range of articulations is limited, but the sheer musicality of the library shines through. They say you get what you pay for, but I think in the case of GIO you get rather a lot more: Garritan has consistently demonstrated that he is on the side of the musician, and his latest library looks set to keep the musical community on board, on budget and creatively engaged. Other libraries featuring mixed-instrument orchestral ensembles include Spitfire Albion and Project SAM's Symphobia series. However, both are considerably more expensive (and much bigger) than GIO, and lack the real-time, on-the-fly blending capabilities of the Garritan library. 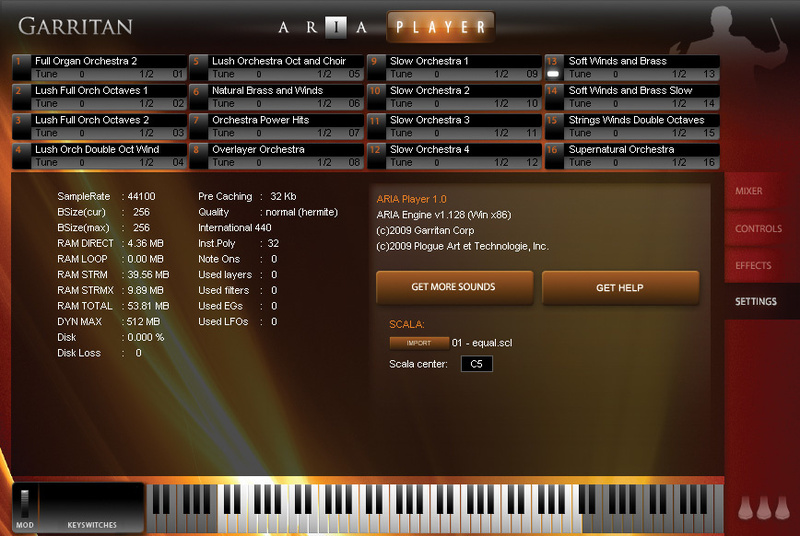 Garritan Instant Orchestra is formatted exclusively for the ARIA sound engine supplied with the library, which runs stand-alone and as a VST, AU or RTAS plug-in on Windows (Windows 7, XP with SP2 or SP3, Vista) and Mac (OS X 10.5 minimum). The makers recommend a Windows Core 2 Duo or Mac Intel computer (or better) with 2GB of RAM, and installation requires 3GB of free hard drive space. Activation is done online ,using a supplied serial number. You'll be issued with a keycard PNG image, which must be dropped onto the ARIA Player screen to activate the library. Cheap as chips, but a lot more nutritious. 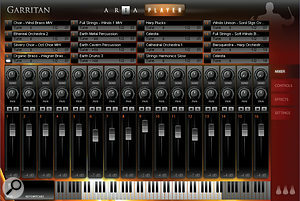 Contains a large variety of unusual and colourful orchestral textures. Generally not as lush as high-end orchestral libraries. Once again, Garritan demonstrates that small can be beautiful. Although modestly sized by today's standards, GIO contains a large number of highly usable orchestral textures, mixed ensembles and effects. It can't rival the deeply sampled, multi-miked instruments of more expensive high-end libraries, but its musical combinations are imaginative and often inspiring, and some of the textures are beautiful. Easy to use, inexpensive and a good supplement to GPO4, GIO has much to offer entry-level users, and some of its content should tickle the fancy of experienced pros. Garritan +1 952 937 9703.